Over the centuries, a number of composers possessed a particularly distinct flair for writing universally recognisable melodies. Norwegian romantic composer Edvard Grieg arguably is one of them. It was violinist Ole Bull who not only advised Grieg�s parents to send the 15-year old Edvard to the renowned Leipzig Conservatory, but who upon his return also roamed the unspoiled landscapes of western Norway with him, thus enabling Grieg to truly get to know Norwegian folk music and to help him develop his own musical language. Grieg later said: �Ole Bull was my guardian angel. He opened my eyes to the beauty and originality of Norwegian music. Thanks to him, I got to know a lot of forgotten folk songs and, above all, I became aware of my own nature.� Being inspired by Norwegian folk music helped Grieg to become the most important Norwegian composer of his generation and gave Norwegian music a place in the standard classical repertoire. 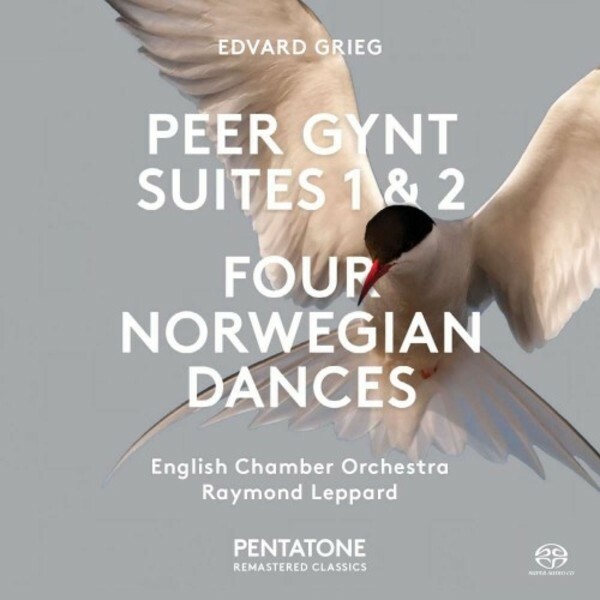 Among Grieg�s most popular works are his incidental music to Peer Gynt, commissioned from the Norwegian playwright Henrik Ibsen, and his arrangements of Norwegian dances and songs. This release in PENTATONE�s Remastered Classics series combines these wonderful works, recorded in the 1970s by the English Chamber Orchestra, under the direction of Raymond Leppard. Philips Classics began making multi-channel recordings back in the 1970s, at a time when most companies were still only recording in two-channel stereo. The concept of surround sound was as yet unheard of, let alone the possibility that this might someday be reproduced at home in the living room. Now, thanks to the advent of the Super Audio CD � a CD with two layers, the first of which includes the traditional CD signal, and the second the signal for surround sound � there is finally a medium that makes it possible for these magnificent recordings to reach the public with all their original possibilities and quality intact. In remastering these multi-channel tapes � most of which had been sitting in their boxes for at least 30 years � our sound engineers had at their disposal the original testing and tuning tapes, and were therefore able to replicate the original process used with the analogue machines. The analogue machines were directly connected to state-ofthe- art DSD analogue to digital converters, strictly bypassing any mixing consoles and/or other special equipment which might influence the sound, and transferring the information in its original multi-channel glory to the Super Audio CD.